With the help of GlobalGiving and PCG, Auroville Language Lab is now able to start off with our Group Tomatis English Language Training Program. This training would offer Tamil women living in Auroville and adjacent villages an opportunity to learn and improve their English through the Tomatis Method, an effective way of retraining the ear to listen to sound frequencies that we find difficult to hear. The listening training helps understand and speak the language fluently; voice exercises further refine pronunciation. The Tomatis Method also helps boost self-esteem and confidence rapidly, along with attention, concentration and memory. Each program would be based on a group of 6 women who would go through extensive daily training for one and a half hours (Monday to Friday) over a period of two-and-a-half months. The program would start on 3rd December 2018. We will make a presentation on the Tomatis Listening Training and would talk extensively about this project on 24th of November 2018, at 10:00 am at the Lab. We request all Auroville Service, Educational and Commercial Units to spread the word to the Tamil women in their teams and facilitate the participation of Tamil women in this Group Tomatis English Language Training Program. For further details, please contact us. We are also happy to offer Group Tomatis Language Training Programs for all the Languages. Each group would be based on one language, with participants of the same level. All nationalities and all genders living in Auroville and around, can participate in this program. 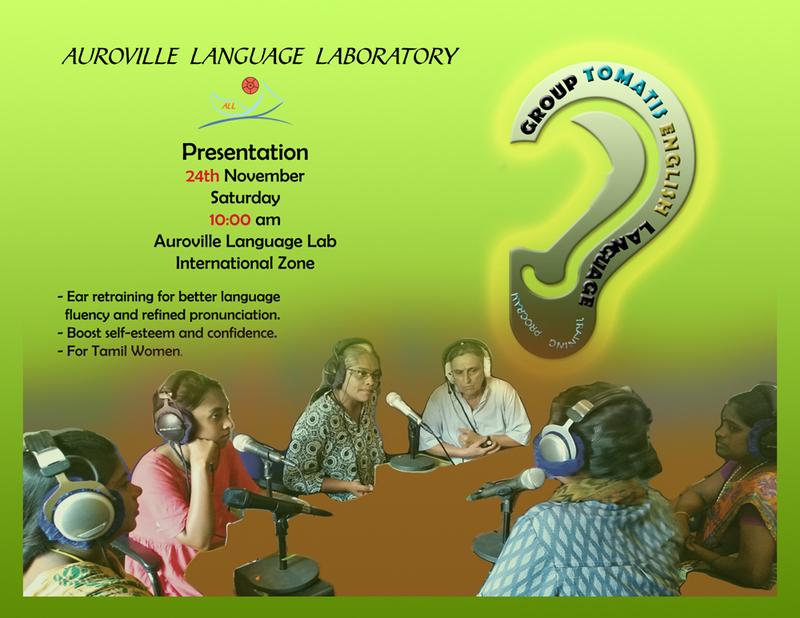 JWe would like to start the program mid-December, hence interested individuals or groups can write to us @ info@aurovillelanguagelab.org(headline : Group Tomatis Language Training) or call us @ 2623661/2000013/2000014. We are starting a third new program which connects art practice and Tomatis Listening and Ear Training. In this Training, individuals would be listening with the Tomatis Headphones and would create art while going through the listening training. People living in and around Auroville can participate in this program. We would start this program in December as well. People interested can already start registering. It has taken us several years of effort to be able to offer the Tomatis training for groups. This fulfils one of our long-standing goals; we are deeply happy and look forward to this next step for the Language Lab. The regular individual Tomatis programs for language leaning and various therapeutic applications continue of course! And so do the regular classes! Check out our website : www.aurovillelanguagelab.orgfor more information. Contact : info@aurovillelanguagelab.orgor call us @ 2623661/2000013/2000014.